There are very few organizations with worse luck than the ill-fated Canadian Air and Space Museum, a Downsview ON based charity now known as the Toronto International Aerospace Museum because of a spat it got into with the Ottawa ON based Canadian Aviation and Space Museum (CASM), an organization with a very similar sounding name, but better funding. Summer 2018 photo of the replica CF-105 Avro Arrow owned by the museum. Portions of the plastic covering protecting the model have fallen off to expose the model to the elements. Photo c/o Sameer Haqqi. It operated out of the historic de Havilland Canada aircraft manufacturing building from 1999 until 2011, when the museum was evicted by the landlord, the Federal Crown Corporation known as Park Downview Park (PDP) for a variety of reasons which, even today, seem contradictory and confusing. Since then, the organization has been struggling to find a new home for the museum exhibits, which were originally stored in twenty-one rented trailers at the Toronto ON based Pearson International Airport and at several other locations around the city. Recent events, including the relocation of the rented trailers to a "secure facility" in Caledon ON, along with an August 21st, 2018 #GoFundMe campaign under the headline "Preserving CF-105 Arrow replica" organized by "volunteers and members of now-defunct Toronto Air and Space Museum/ Canadian Air and Space Museum" suggest that the string of bad luck has continued. As outlined on their GoFundMe page, the campaign has managed to raise just under $3000 of the $10,000 necessary to fulfill the requirements of the campaign, and provide a second coating of the heavy duty shrink-wrap needed to preserve a full sized replica of Canada's famed CF-105 Avro Arrow, which has been mostly sitting in a parking lot at Pearson since the spring of 2016. The campaign, although not formally affiliated with the museum, did ask permission from the museum's CEO, a local entrepreneur named Ian McDougall, who gave permission for the campaign "to raise funds to shrink wrap this replica again to protect it from elements in the open air environment" for the #GoFundMeCampaign. However, at least according to Brian Keaveney, the "volunteer curator" for the museum who spoke with this blog on Monday, the museum isn't defunct and a new partner should be coming aboard soon to help cover costs and assist with the opening of either a new facility or new facilities, where artifacts can again be displayed. Of course, it's not as if Keaveney is able to release the name of the potential partner publicly or any time frame for a formal announcement. In fact, he insisted during the interview that he hasn't been involved in any of the negotiations with the potential partner and doesn't know the name of the individual/ organization involved. Undated Brian Keaveney photo c/o @Phunsecks123. But Keaveney insisted that there is a contract on the table with a legitimate partner just awaiting the working out of a few details. 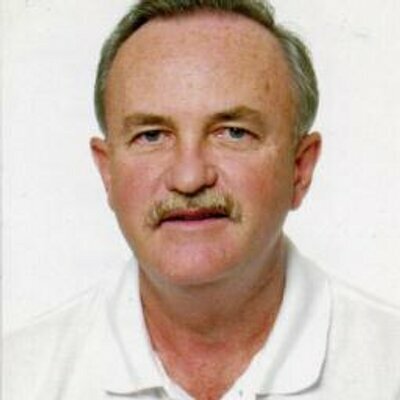 An announcement could be released sometime in the future, but Keaveney wouldn't say when. Keaveney also said that the museum artifacts are stored appropriately at their new location in Caledon, although he hasn't visited the area. 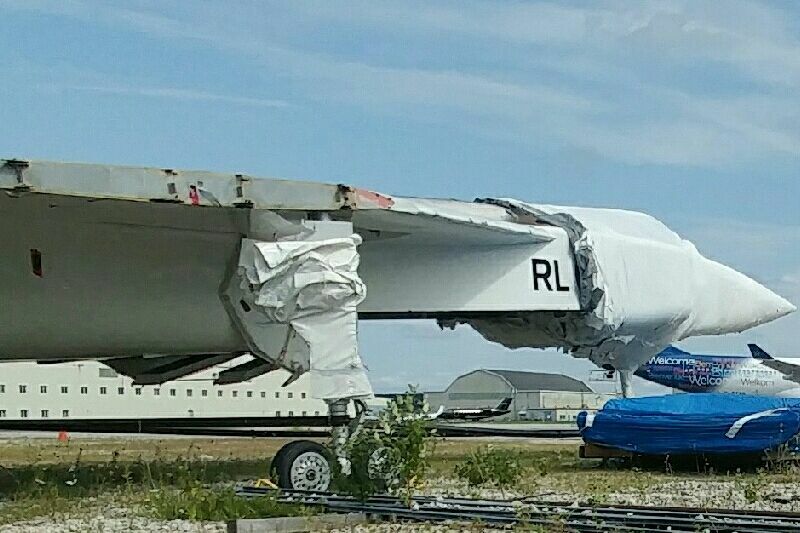 As well, Keaveney doesn't think that there is any damage to the stored museum artifacts, although that statement is demonstrably false when it comes to the only artifact we can independently verify, the Avro Arrow replica currently sitting in a parking lot at Pearson. Keaveney said that it was not possible to set up a trip to Caledon to view the artifacts and confirm their condition. But Keaveney did say that the new partner/prospect is in no way, shape or form related to the Greater Toronto Airports Authority (GTAA), the organization which manages Pearson Airport, where most of the artifacts were once stored. At one time, the expectation was that the museum artifacts would eventually end-up on display at Pearson. Of course, none of the information provided by Keaveney is currently available on the museum website and he admits that even his listed e-mail address on the website simply doesn't work. "We were hacked a couple months back," said Keaveney, "I haven't had time to fix it." The website seems to have been last updated in March 2018. And the person who would be most likely to have some actual knowledge of the situation, museum CEO McDougall has (so far at least) not responded to requests for an interview. As outlined in the July 24th, 2018 Toronto Sun post, "Toronto Lancaster headed west," at least one museum display, a World War II Lancaster Bomber, has been shipped off to another museum. According to Keaveney, the Lancaster bomber was owned by the City of Toronto and they could do with it as they wished. Graphic c/o Toronto Sun. There is no doubt to knowledgeable observers that the museum has seen better days, although Keaveney is also right when he said that at least the current museum board under McDougall has managed to keep most of the collection together. But the current situation is getting so difficult for museum members that some have begun suggesting that, since there is no consensus on how to move forward, a vote must be taken to dissolve the museum. Only then will the board be able to donate the slowly (possibly) deteriorating museum artifacts to other not-for-profit organizations or museums, where they can be restored and protected. Whether or not this is a fair resolution for the 170+ volunteers that spent eight and a half years building the Avro Arrow replica is another question entirely. Two years ago, the July 11th, 2016 post, "Whatever Happened to the Canadian Air & Space Museum?" this blog reported on a $250K CDN "non-receipted" contribution from an unnamed donor, which essentially cleared off all debts associated with storing the artifacts and suggested that there was at least a possibility of reopening the museum at a new location at or around Pearson Airport. But that money seems to have been spent and the situation doesn't seem to have gotten any better. Here's wishing the museum better luck next time. The Growing US Space Industry is Scrambling to Find Workers, but Can't Hire "Foreigners"
The Orlando Sentinel is reporting that, while the space industry located along Florida’s space coast is flourishing, employers "are scrambling to find qualified employees to temper a national shortage in the science, technology, engineering and math fields," because of current US legislation, which restricts many well trained, but non-US citizens, from holding down US jobs. He even looks a bit like the young Justin Trudeau. Shayan Shirankekar is a Canadian citizen who grew up on "the unlucky side of Lake Ontario, in Toronto, an hour drive from the US border," and can't get a Florida space job, according to the Orlando Sentinel. 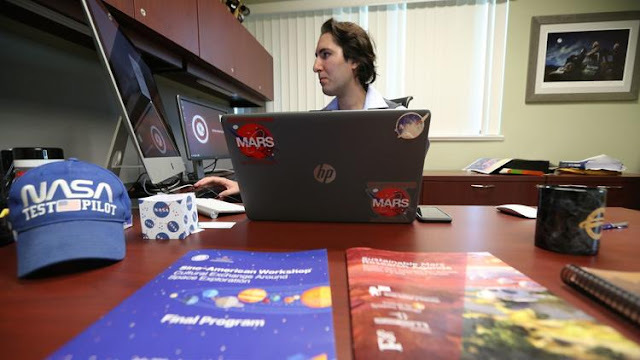 Shirankekar is currently working at an unpaid internship at the Aldrin Space Institute, on the campus of the Florida Institute of Technology, where he is a PhD candidate. Photo c/o Ricardo Ramirez Buxeda / Orlando Sentinel. As outlined in the October 25th, 2018 Orlando Sentinel post, "The growing space industry is scrambling to find workers — but it can't take foreigners," the 1976 International Traffic in Arms Regulation (ITAR) classified spacecraft and rockets as military technology and only US citizens or permanent residents can work for NASA or the major private space companies which utilize those tools. Ironically, many of those qualified students are already here at schools such as the University of Central Florida, Embry–Riddle Aeronautical University and the Florida Institute of Technology in Melbourne. Florida Tech, in particular, prides itself in a student body that is about one-third international. The school has been ranked as No.1 in the nation for its foreign student population by U.S. News and World Report for at least the past four years. US industry has pushed back against the regulations in recent years, saying it stifles growth. The February 2014 US Department of Commerce Bureau of Industry and Security Office of Technology Evaluation white paper, "Space Industry Deep Dive Assessment on the Impact of US Expert Controls and the Space Industrial Base" noted numerous areas where US export controls have adversely impacted on the health and competitiveness of the US space industry. In 2014 and 2017, companies successfully lobbied the US Congress to relax some of the rules surrounding the export of satellite technologies overseas. A White Paper on the "Case for a Global Telemedicine Vehicle Network"
Nearly 50% of the world’s population have no access to basic health services. A new "white paper" from Ottawa ON based C-COM Satellite Systems hopes to address this challenge using modern telemedicine and telecommunications technologies. According to the white paper, the vast majority of the world's population lives outside cities, in areas where few hospitals exist and healthcare is sporadic. Those geographical areas with limited to no healthcare accessibility are called ‘medical deserts,’ and they continue to expand as people move out of rural regions and into cities. Medical deserts can be found in both developed and developing countries alike. In the United States, approximately 30 million people live more than 30 miles from a hospital that provides emergency care. In Niger, more than 60% of the population (10 million people) live further than a one hour walk to a basic healthcare center. While Africa is urbanizing, approximately 63 percent of the total Sub-Saharan population still live in rural areas. Even France, often lauded as a prized model for national healthcare, has struggled with a steady decline in rural doctors, notably general practitioners. Use modern Earth imaging and communications technologies to identify the world’s "medical deserts." The work together to create a global telemedicine vehicle network to address the problem and reverse the decline of healthcare in rural and hard to serve communities. The complete paper, under the title "The Case for a Global Telemedicine Vehicle Network: A Mobile Health Clinic White Paper," is available online at the C-COM website. Both the US Centers for Disease Control (CDC) and the National Institutes of Health (NIH) have confirmed that a direct correlation exists between distance to hospitals and an increased risk of preventable death. In India, for example, it was estimated that 50,000 deaths (out of 72,000) from sudden abdominal conditions in 2010 could have been averted with better medical access. Those who lived more than 100km from a hospital were at the highest risk. A 2016 study showed that only 1 in 8 high income countries had developed a national policy on hospitals in rural or remote areas. Rural healthcare facilities have historically been a poor investment and their sustainability is concerning. Even in the US, 83 rural hospitals have closed since 2010 with another 673 vulnerable to shut down. And while healthcare costs vary dramatically from country to country, a sad reality is that it will never be economically feasible to build hospitals or health care facilities in all the world’s medical deserts. 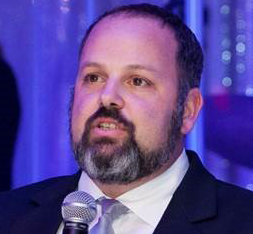 Drew Klein is the director of international business development at Ottawa ON based C-COM Satellite Systems. 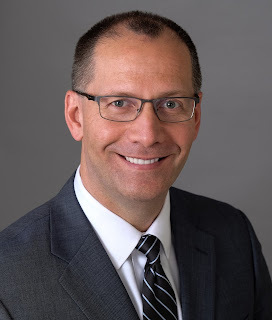 The original version of this post appeared as the October 25th, 2019 C-Com press release, "The Case for a Global Telemedicine Vehicle Network." 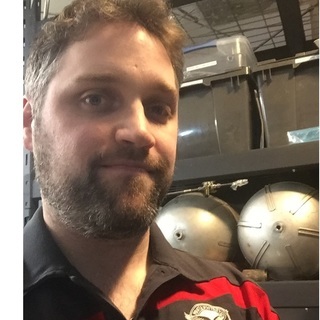 Propulsion engineer Adam Trumpour has unveiled the Launch Canada Rocket Innovation Challenge, Canada’s first major rocket competition. The contest will offer Canadians the opportunity to build a home grown space launch capability, in turn fostering a vibrant private launch industry. 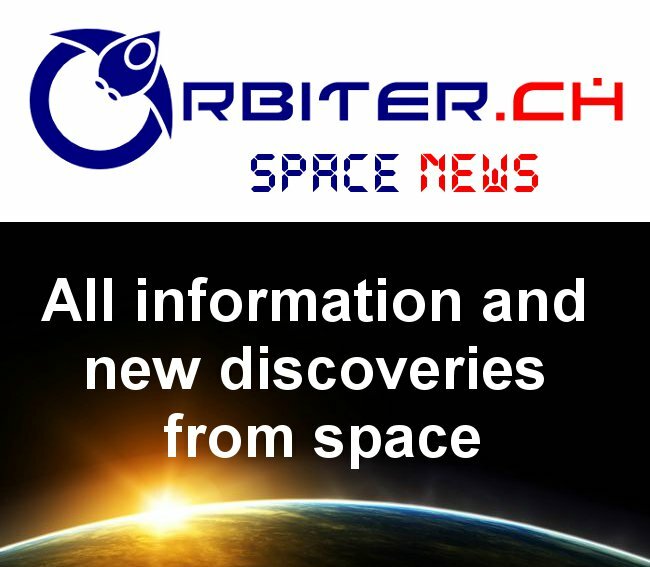 The announcement was made on October 18th, 2018 at the Montreal Space Symposium. Launch Canada seeks to enable Canada's growing student rocketry community to take their activities to the next level by embracing the idea of ‘grassroots rocketry.’ Referring to the success of firms like Hawthorne CA based SpaceX, Kent Washington based Blue Origin and Huntington Beach CA based Rocket Lab, Trumpour made the point that groups initially made up of amateurs have achieved success and are now building sophisticated spacecraft and pushing the envelope of a host of technologies. It is this success that he wishes to replicate in Canada. Trumpour’s motivations behind the contest are varied, but include the desire to reverse the decline of Canada’s space sector, undoing Canadians’ self-limiting colonial mindset, diversifying Canada’s economy and creating new opportunities for Canada’s workforce. Adam Trumpour. Photo c/o CSCA. Beginner Launch Challenge – A more accessible challenge intended for less experienced teams to build their expertise and interact with the larger Canadian rocketry community. It will involve building and launching a rocket to an altitude of 10,000 feet. The use of off-the-shelf hobby rocket motors will be permitted. Points will be awarded for reaching the target altitude as well for demonstrating a useful payload. Advanced Launch Challenge - This challenge involves the successful launch of student-developed rocket vehicles to high altitudes. The emphasis will be on overall systems engineering, incentivizing the use of innovative technologies and concepts as well as the development of reusable launch vehicles. Launch Canada is intended to be a recurring annual competition (beginning in Summer 2019) with prize money allocated as a percentage of donations raised from industry. The current prize purse, consisting of donations from several Canadian rocket engineers, is $30,000 CDN. Trumpour is modelling Launch Canada on the Base 11 Space Challenge, an ambitious $1Mln US ($1.3Mln CDN) competition for the first student-built liquid-propellant rocket to reach space. Trumpour currently sits on the Base 11 Space Challenge’s Safety Committee, conducting rocketry safety training for all teams and several Canadian teams are competing in the Base 11 challenge. The Launch Canada Rocket Innovation Challenge comes at a branch-point in Canadian history. The United Sates’ behavior during the recent NAFTA renegotiation, culminating in US President Donald Trump’s repeated threats to the Canadian economy, have made clear the need for Canada to protect its homegrown talent and diversify its trade. An independent Canadian space launch industry would offer greater opportunity, keep Canadian talent at home and protect our nation’s space activities from foreign interference. Perhaps, on a day not far from now, maple Leaf-bearing rockets could propel us away from America’s grip. Brampton ON based MDA Space Missions (a subsidiary of Westminster, CO based Maxar Technologies) group president Mike Greenley made an in-person presentation to the House of Commons Standing Committee on Finance (FINA) Pre-Budget Consultations in Advance of the 2019 Budget. Mike Greenley with Federal Innovation Minister Navdeep Bains in May 2018. As outlined in the May 30th, 2018 Maxar Technologies press release, "Maxar's MDA Drives Innovation in Support of Canadian Government Space Activities," MDA already receives substantial funding from the Canadian government for its programs. Photo c/o MDA. According to the meeting transcript, Greenley claimed to be representing "several hundred other Canadian companies today that are engaged in Canada's space industry," likely because of MDA's affiliation with the Don't Let Go Canada advocacy campaign, but spent most of his presentation lobbying for funding for a "third generation Canadarm" to contribute to the US led Lunar Orbital Platform-Gateway (Lunar Gateway). The full presentation is transcribed online on the as part of the October 4th, 2018 FINA Committee Meeting (#173) web page. Given that MDA stands to profit handsomely should their recommendation to fund a "third generation Canadarm" be accepted by the Federal Liberal government, this blog will be going into that presentation in more detail for our Tuesday edition. It's good that Halifax NS based Maritime Launch Services (MLS) made an in-person presentation to the House of Commons Standing Committee on Finance (FINA) Pre-Budget Consultations in Advance of the 2019 Budget. MLS CEO Matier (left) with and Maksym Degtiarov, the chief designer of the Cyclone 4-M launch vehicle at the Yuzhnoye Design Bureau, talks with reporters in Dartmouth NS on December 11th, 2017. As outlined in the December 11th, 2017 CBC News post, "Proposed Canso rocket site hopes to eventually reach 12 launches per year," MLS has been working closely with designers from the Ukrainian based Yuzhnoye State Design Office. Photo c/o Andrew Vaughan/Canadian Press. But if MLS CEO and president Stephen Matier really want to compete on the open launch market and interest the Federal government in supporting Canadian based initiatives, he should take a look at the most recent Space Investment Quarterly, from the New York NY based Space Angels, which covers the third quarter of 2018. In our last issue, we saw growing evidence that 2018 would be the year of small launch and indeed that trend has continued in Q3 2018, with investment in launch now exceeding $1Bln US ($1.3Bln CDN) year-to-date. This quarter was also significant for Satellites, with over $370Mln US ($484Mln CDN) flowing into the industry driven by growth in Series B rounds led by venture capital firms, demonstrating their conviction in the tremendous value in scaling this technology. This suggests strongly that the international launch market, along with the development of the infrastructure needed to move it forward, is growing strongly because of increasing investments from the private sector. Our collective request of the government of Canada is to actively focus their support on the budding industry so that Canada can capture the market share that is obviously ours for the taking. Spaceport development and launch vehicle development initiatives in other countries including New Zealand, the United Kingdom, Australia, Mexico and others, are just now gearing up and those governments are finding ways to support the infrastructure development and the launch vehicle development. All the assets are here and in place except for active and streamlined government support for this global opportunity. As with the other countries and programs mentioned, there are significant numbers of investors ready to participate in the development of the opportunity, now that their governments have openly supported and seeded the initiatives with investment dollars. For Maritime Launch Services, and as the language in Connect to Innovate states, we see ourselves as a part of new backbone infrastructure in rural and remote communities across Canada for our launch site development and for our mission to support global broadband priorities. Building this infrastructure is the modern equivalent of building roads or railway spurs into rural and remote areas, connecting them to the global economy. This backbone infrastructure is the basis for the launch vehicles and satellites that are needed in today's connected world. According to Matier, governments around the world are "gearing up" to prepare for the next space race and the Canadian government should also be preparing to support investment in this area. According to the Space Angels, a privately held financial services company focused on investments in the aerospace industry, its the private sector which is "gearing up." to invest and grow the market in whichever jurisdiction happens to provide the best conditions for private sector investments. Not that there's anything wrong with that. One of the legitimate roles of the Federal government is to lower barriers for the creation of new investment opportunities and attract international business. While this blog has long been critical of MLS and its reliance on "legacy" Russian/ Ukrainian rocket technology for its business model, this is one area where we are both in complete agreement. Screenshot of the Federal government ParlVu website. To hear the complete audio recording of meeting 171, simply click on this link. Graphic c/o Government of Canada. As outlined on the FINA website, Matier presented to FINA on October 2nd 2018. His presentation is available online as part of the October 2nd, 2018 FINA meeting number 171 on the ParlVu website and takes place from approximately 10.06.15 until approximately 10.17.00. A transcript of the presentation is available as part of the October 17th, 2018 SpaceQ post, "Maritime Launch Services Takes it Vision to the Finance Committee in Person." Many of the most senior of the "usual suspects" involved in Canada's space industry were in Ottawa on October 16th, attending the "Ready for Launch: Preparing Canada for a Future in Space," conference organized by the Calgary AB based Canadian Global Affairs Institute (CGAI). Panel discussion with (from left to right) CGAI moderator Mike Day, former CSA president "Mac" Evans, SAB chair Lucie Stojak, former CSA astronaut Robert Thirsk and current CSA president Sylvain Laporte. Photo c/o @LeslieSwartman. 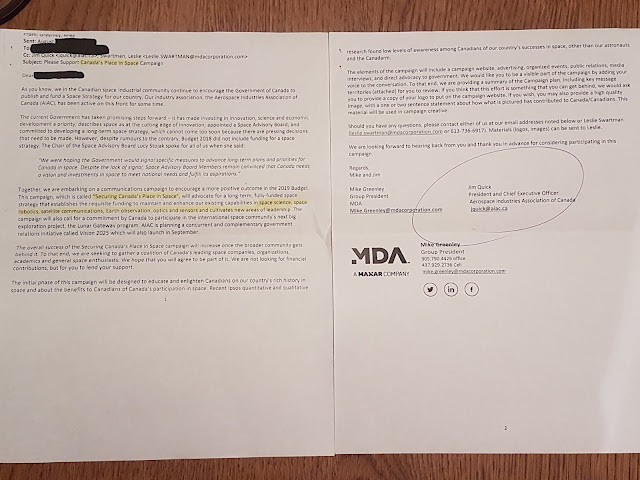 As outlined first in the September 18th, 2018 post, "Colorado Based Maxar/MDA Asking for $1-2Bln to Build Another Canadarm for the US LOP-G," it was also a keynote event for the Brampton ON based MDA Space Missions (a subsidiary of Westminster, CO based Maxar Technologies) and its Don't Let Go Canada advocacy campaign to lobby the Federal Liberal government to fund a new, "third generation" Canadarm for the US Lunar Orbital Platform-Gateway (Lunar Gateway). Federal Transport Minister (and former astronaut) Marc Garneau. Former Canadian Space Agency (CSA) president William "Mac" Evans. Federal Space Advisory Board (SAB) chair Lucy Stojak. Former CSA astronaut Robert Thirsk. 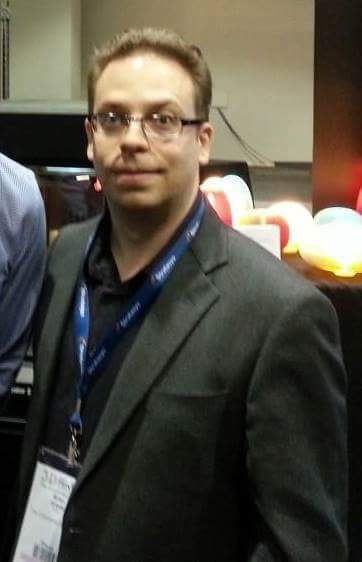 Current CSA president Sylvain Laporte. 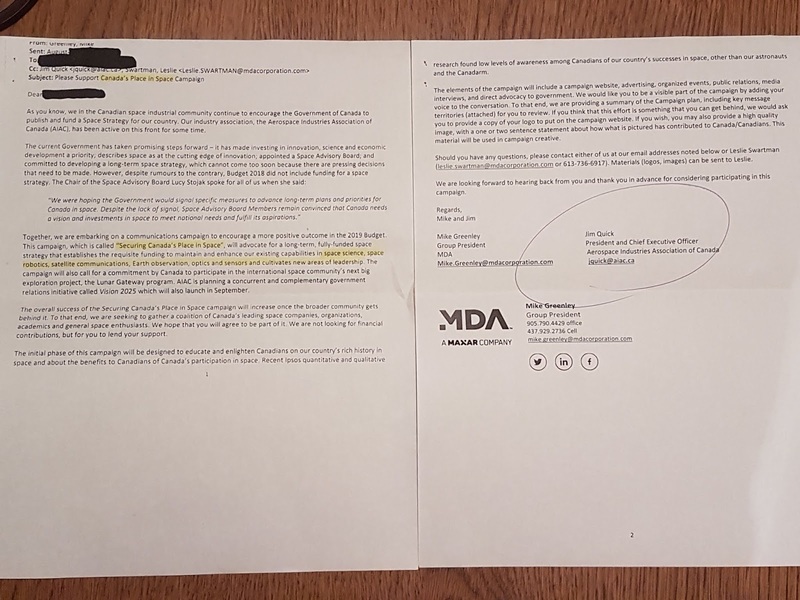 MDA group president Mike Greenley. Honeywell Canada senior director of space missions Marina Mississian. Magellan Aerospace division manager of defence and space products David O’Connor plus quite a number of others. Even CBC science journalist Bob MacDonald dropped in for a bit to have a "fireside chat" on the new space age with Kenneth Hodgkins, the director for the Office of Space and Advanced Technology at the US Department of State. 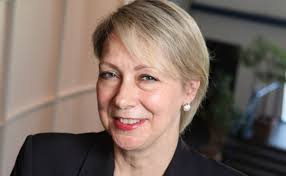 Hodgkins is also listed as speaker at the Washington DC based Wilson Institute and many of the speakers at the October 16th event in Canada were previously highlighted at a September 7th, 2018 event in Washington DC titled "Over the Horizon: A New Era for Canada-U.S. Space Cooperation?" which covered much the same territory and was held through the Wilson Centre. ...chartered by Congress as the living memorial to President Woodrow Wilson, is the nation’s key non-partisan policy forum. In tackling global issues through independent research and open dialogue, the Center informs actionable ideas for Congress, the administration, and the broader policy community. Kenneth Hodgkins in conversation with Bob McDonald in Ottawa on October 16th, 2018. Photo c/o @CAGlobalAffairs. Unfortunately, Federal Innovation Minister Navdeep Bains wasn't in attendance. Bains is one of the most powerful Liberal ministers in the current government and the one directly responsible for the portfolio which includes both the CSA and science spending. He's also the one person in the Federal government most able to generate funding for the various programs which were discussed at the event. In his place was Denis Bourque the Director of Policy for Innovation, Science and Economic Development (ISED) Canada, who can be expected to report back to Minister Bains on the day's activities. Prashant Shukle, the Director General of Resources for Natural Resources Canada (NRCan) was also in attendance. As outlined in the June 8th, 2018 post, "NRCan Explores Space Mining," there have been some mid-level space focused initiatives coming out of that department recently. For those looking to learn more, videos of some of the discussions and a few of the more interesting conversations from the event are on twitter under the #CGAIspace hashtag. Lucy Stojack, the chair of the Federally mandated Space Advisory Board (SAB), has sent out an e-mail outlining the half dozen events SAB members have attended recently plus listed several additional upcoming events which members expect to participate in this fall. As the Chair of the Space Advisory Board, I hope this newsletter finds you well rested after the summer and poised for the fall. This summer was indeed a busy one! The Board provided updated advice to the Minister on Canadian space opportunities and risks in relation to global space trends as a follow on to our (August 2017) report Consultations on Canada’s Future in Space: What We Heard. We have also been in regular contact with the Minister’s office (Innovation Minister Navdeep Bains) to provide advice and input as the Government moves forward on the development of a long-term vision for space; we continue to reinforce insights gained from Canadian stakeholders and to underscore the urgent need for Government action. Furthermore, we have been busy participating in multiple events across Canada and the US to highlight the benefits of space to Canadians and the importance of the Canadian space sector at home and abroad. WILSON CENTER EVENT – On September 7, 2018, the Woodrow Wilson Center, based in Washington D.C., hosted a one-day conference on Canada-U.S. space cooperation. The Wilson Center convened a high-level strategic policy dialogue, as U.S. and Canadian officials (NASA Administrator Jim Bridenstine and CSA President Sylvain Laporte) and representatives from communications, robotics, and aerospace companies addressed civilian and military space, emerging threats, and new technologies. Experts also examined how government and industry can work together on principles, norms, and institutions that will ensure responsible human activity in a changing space domain. 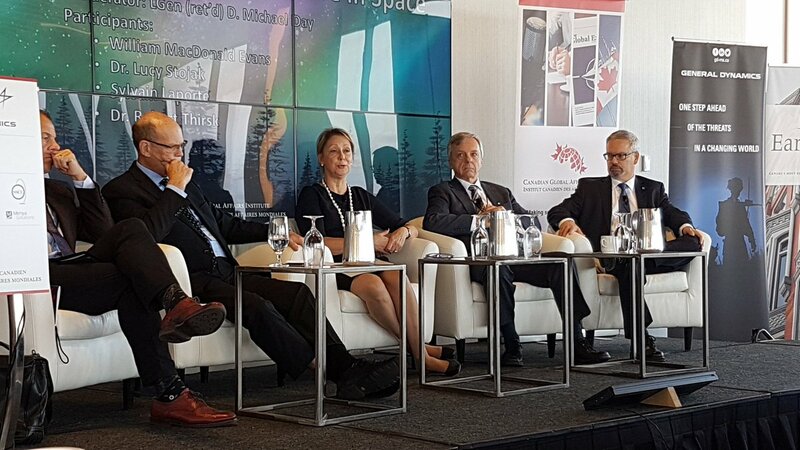 Space Advisory Board members Mac Evans, Lucy Stojak and Mike Pley participated on panel discussions throughout the conference to provide expertise on Canada’s space history, international space regulations and Canada’s civilian space program. SPACE ADVISORY BOARD MEETING IN OTTAWA WITH US GOVERNMENT OFFICIALS – On September 17, 2018 several members of the Board met with William Gerstenmaier, Associate Administrator, Human Exploration and Operations at NASA along with representatives from the State Department, Department of Commerce and the U.S. Embassy to Canada. The discussion was focused around NASA’s future space exploration plans and how to better leverage commercial space. Canada’s opportunities in future space projects/programs were also discussed. DIGITAL ROUNDTABLES – Innovation Science and Economic Development Canada had digital innovation leaders host roundtable discussions in cities across Canada with business, academia, civil society and others. The Space Advisory Board participated in a number of these roundtables. LET GO CANADA: SECURING CANADA’S PLACE IN SPACE – On September 17, 2018 a coalition of Canadian space stakeholders representing industry, academia and the space enthusiast community had an event at iPolitics to raise awareness of Canada’s accomplishments in space. The event was focused around the findings of the public opinion research by Ipsos with an expert panel representing different views on the sector. The panel participants included two Board members, Kate Howells and Mike Pley. U.S. EMBASSY OTTAWA AND ACTUA PRESENT A VIDEO CHAT WITH THE INTERNATIONAL SPACE STATION – On Friday, September 21, 2018 the United States Embassy in Ottawa, in partnership with Actua, Canada’s largest science, technology, engineering and math outreach organization, hosted a video chat between local Ottawa elementary school students, stakeholders, and American-Canadian astronaut Drew Feustel at the Canadian Aviation and Space Museum. Drew is currently aboard the International Space Station and is Commander of its 56th mission. Kate Howells participated in a panel discussion on STEM with Drew’s wife, Indira Feustel; the Honourable Navdeep Bains, Minister of Innovation, Science and Economic Development; and the Honourable Marc Garneau, Minister of Transport, and Canada’s first astronaut in space. FIRESIDE CHAT WITH CANADIAN ASTRONAUTS – On Friday, September 21, 2018, at the University of Ottawa, Space Advisory Board Member Mac Evans attended an event of nine Canadian Astronauts participating in a panel discussion on Canada’s role in space exploration. Points of discussion included ‘New Space,’ next steps for Canadian space exploration, the changing roles of astronauts, the importance of space, STEM programs, and international collaboration. The Board will be participating in additional upcoming fall events to continue to engage with the public and to build momentum. These events include the Canadian Global Affairs Institute’s Space Conference (October 16th in Ottawa), the Canadian Science Policy Conference (November 7th - 9th in Ottawa), the AIAC Canadian Aerospace Summit (November 13th - 14th in Ottawa), and the Canadian Space Summit (November 27th - 29th in Ottawa). In the coming weeks, the Board will also meet with (Navdeep Bains) the Minister of Innovation, Science and Economic Development Canada. This meeting will provide an opportunity for the Board members to update the Minister on our continued engagement with the space sector in Canada and abroad, and provide feedback on what we heard. This meeting will also provide an opportunity to discuss how best the Space Advisory Board can continue to advise the Minister and inform the government’s work as it develops a long term vision for Canada’s space program. Finally, we will remain engaged with the public on Canada’s future in space through our participation in the above mentioned events and welcome input through contact with members of the Board at these events or e-mail to ic.sab-cce.ic@canada.ca. Please note that the Space Advisory Board website URL has changed, here is the updated link: http://www.ic.gc.ca/eic/site/082.nsf/eng/h_03983.html. While the specifics of the contributions to each event listed in the e-mail is not always explained, the overall suggestion is that the SAB is at least working hard for the Canadian space industry. If Stojak and the SAB only including a few discussions about the specific solutions they were advocating and the actual influence the SAB has with the Federal government, then we could start getting really excited. Although the participants at several upcoming events over the next few weeks are expected to strongly lobby the Federal government to provide new funding for space focused projects, the Canadian Space Agency (CSA) has just gone out of its way to remind applicants that, while Federal funding for artificial intelligence (AI) is hot (even when the AI firms being funded are actually space companies), Federal funding for space activities is not. ... is positioning Canada's space community to maintain its global leadership in space robotics. Accordingly, the CSA announced today that it is investing $1.6Mln CDN in two concepts for lunar rovers that would use artificial intelligence (AI) to make their own decisions. 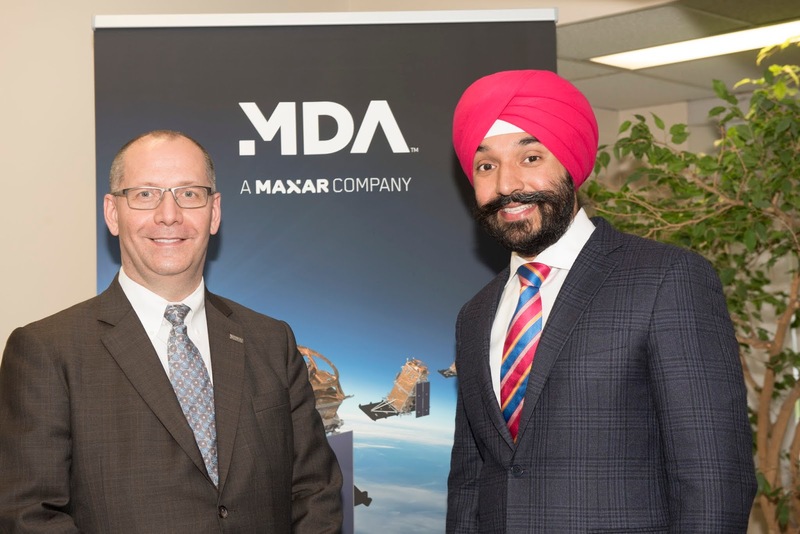 According to the press release, Brampton ON based MDA, a subsidiary of Westminster CO based Maxar Technologies and Caledon ON based Canadensys Aerospace Corporation have each been awarded a contract worth $800 000 CDN to develop innovative rovers using AI concepts for the CSA. The contracts awarded will support sixty-one "well-paying jobs" and position Canada to play an important role in future missions to the Moon. But for the rest of us, we'll need to find private sector partners. The CSA made their latest announcement at the start of a three-day CSA "Industry Days" event to promote Canadian space capabilities to major space companies, including Kent WA based Blue Origin, Ottobrunn, Germany based Airbus Defense and Space and Cape Canaveral FL based Moon Express. More than forty-four organizations are expected to attend the event from October 15th - 17th and over 70 business-to-business meetings are expected to take place, according to the press release. Hopefully, some of those meetings will generate deals. This is not the first time the Federal government has favored funding AI development over space activities. As outlined most recently in the October 9th, 2018 post, "Creative Destruction Lab Receives $25Mln CDN from Federal Government for AI, Start-up Infrastructure and Jobs," the Federal Liberal government is heavily promoting AI investments. As for MDA and Canadensys, they've both received previous funding from the CSA for rovers and can be reasonably expected to go after any new funding. Expect both to apply for the September 20th, 2018 CSA Announcement of Opportunity (AO) "Lunar Exploration Analogue Deployment (LEAD) – Capability Demonstration." To train project managers, engineers, scientists, post-doc fellows and technicians plus support the development of Canadian industrial capabilities in the area of space technologies for the purpose of increasing the commercial potential of Canadian space companies. Expect either MDA or Canadensys to be awarded the latest AO, sometime after it closes on October 26th, 2018. After all, as outlined in the AO, "there will be financial support for only one project awarded to one recipient as a result of this AO." But as outlined in the April 30th, 2018 post, "NASA Resource Prospector Cancellation "Disappointing" Says Deltion Innovations CEO Boucher," the September 26th, 2016 post, "The REAL Reason Why Canada Won't Be Participating in the NASA Resolve Mission Anytime Soon, Probably!," and the October 20th, 2012 post, "Lots and Lots of Rovers Looking for Missions," the CSA has a long history of supporting lunar rover programs which never go anywhere. So lets wait and see what happens this time. The US Air Force (USAF) has awarded a total $2.3Bln US ($3.0Bln CDN) in contracts to three firms to develop launch systems for national security payloads. The announcement is a watershed moment, highlighting the entry of a new player as well as new technology into the US national security launch apparatus. Kent WA based Blue Origin, which received $500Mln US ($650Mln CDN) to build its reusable New Glenn rocket. Centennial, CO based United Launch Services (ULS), a part of the larger United Launch Alliance (ULA), which received $967Mln USD ($1.25Bln CDN) to develop its "partially" reusable Vulcan rocket. ULA is the incumbent in this market and currently provides launch services to the US military using two expendable launch systems, the Delta IV and Atlas V.
Dulles VA based "non-reusable" Northrop Grumman Innovation Systems, which received $791.6Mln CDN ($1.03 CDN) for its Omega rocket. As outlined in the October 10th, 2018 Ars Technica post, "The military chooses which rockets it wants built for the next decade," the contracts are part of a US Department of Defense initiative to ensure stable military access to space and end US reliance on foreign-made rocket engines, such as the ULA Atlas V rocket, which uses Russian RD-180 engines. Blue Origin’s and Northrop’s prototype vehicles are expected to be ready to fly by late 2024 while ULA’s Vulcan rocket is to be completed by March 2025. Blue Origin’s award is of particular note, as it is the second NewSpace firm to win a US military contract after Hawthorne, CA based SpaceX. The USAF’s selection of Blue Origin is likely the hedging of bets to avoid dependence on SpaceX or any other single firm, a situation which happened previously with ULA. From its formation in 2006 as a joint venture between Sunnyvale CA based Lockheed Martin Space Systems and Berkley MI based Boeing Defense, Space & Security ULA dominated and served as the sole supplier for US military space launches until 2017, when SpaceX received accreditation. It's worth noting that SpaceX received permission to launch military payloads only after it had an operational Falcon-9 program lofting commercial satellites into orbits. The SpaceX Falcon Heavy launcher (which was funded through NASA commercial crew contracts) is already certified for all Air Force requirements and, as outlined in the June 21st, 2018 post, "Air Force certifies Falcon Heavy, orders satellite launch for 2020," SpaceX currently has outstanding military contracts for the launcher. In essence, the new awards will each cover the substantial research and development costs needed to roll out operational versions of what are essentially design studies, something not needed in the case of SpaceX. Besides, the SpaceX Falcon Heavy launcher (which was funded through NASA commercial crew contracts) is already certified for all Air Force requirements. As outlined in the June 21st, 2018 post, "Air Force certifies Falcon Heavy, orders satellite launch for 2020," SpaceX currently has outstanding military contracts for this operational launcher. Blue Origin’s New Glenn is a two-stage heavy-lift orbital launch vehicle, development of which began in 2012. With a 7-meter (23 ft) diameter, the New Glenn with a reusable first stage as well as an optional third stage. Its first stage will be powered by seven in-house designed and built BE-4 liquid methane/oxygen engines producing 17,000 kN (3,800,000 lbf) of liftoff thrust. New Glenn will be built at Blue Origin’s Florida factory and launched from Cape Canaveral Air Force Station. In addition to commercial and military satelite launches, New Glenn will also be available for space tourism flights. New Glenn’s first stage boosters are reusable and will be recovered downrange on the Atlantic Ocean via a ship acting as a floating landing platform in much the same way as SpaceX’s Falcon rockets. The awarding of the USAF contract appears to have enabled Blue Origin’s further expansion. Following the USAF’s announcement, Blue Origin revealed that it will build a second launch site at Vandenberg Air Force Base in California, enabling the company to launch from both the east and west coasts. In addition, ULA announced in September that its upcoming Vulcan rocket will be powered by Blue Origin’s BE-4 engines. Of course, providing US government funding to launch providers to develop new rocket launchers is a service not restricted to the military. NASA is also funding an entry for the next generation of rockets with the Space Launch System (SLS), a space shuttle derived super heavy-lift expendable launch vehicle, which has been having more than its fair share of cost overruns and funding shortfalls. Blue Origin’s entry into the realm of national security space launch is a hopeful sign that the space sector can learn from past mistakes, which include being locked into single supplier monopolies (a la ULA), cost-plus procurement contracts (which reward cost overruns) and expensive, single use launchers. With multiple launch providers pursuing multiple markets and goals, the coming decades of space exploration will be far livelier than previous ones.